Thanks to your feedback, on May 1, arapahoelibraries.org will have a fresh and updated look. You will see a more streamlined homepage with easy-to-find content. The main image at the top of the page will be smaller. There will be a dynamic feed of upcoming events and programs. 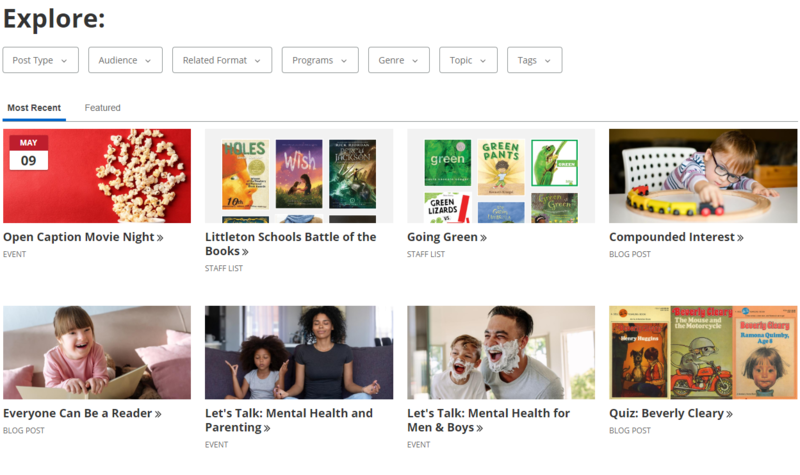 Popular content (staff picks, bestsellers) will have a dedicated place on the page so you always know where to find it. You will be able to view Coming Soon materials right from the homepage. A new Explore page will allow you to easily find staff-created content based on format, age, interests and more! Accessibility will be improved for patrons who use assistive technologies to view the website such as screen reader software, high contrast displays and more. Pretty much everything else will remain the same. The catalog, menus, searching, events, etc., will not change. This update will allow us more flexibility to incorporate changes based on user feedback. Usability testing with patrons will continue to be performed on a regular basis to make sure we are giving users the best website experience possible. Interested in being part of a user testing group in the future? Contact us here!